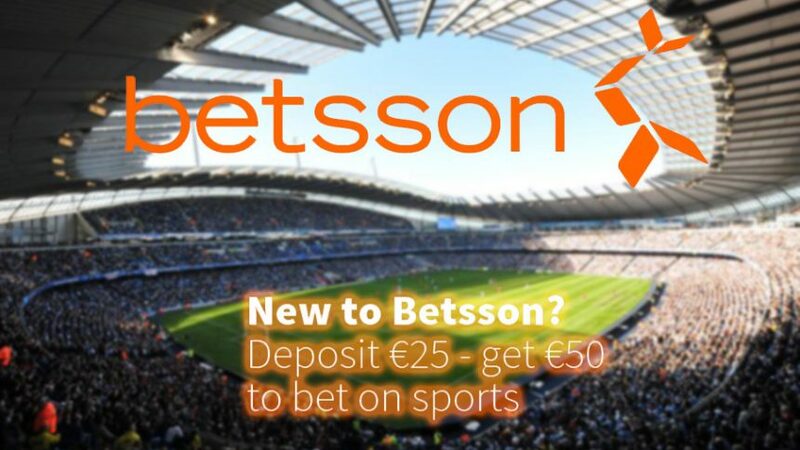 You are here: Home / Deposit Bonuses / Match Bonuses / Mobile Bonuses / Sportsbook Bonuses / Sportsbook Promotions / Collect €50 Today with Betsson Sports Welcome Bonus! Are you a sports betting fan? If so, get up to €50 with the Betsson Sports Welcome Bonus. Simply make a deposit up to €25 and the online sportsbook will match it 100%, essentially giving you up to €50 to bet with. This offer applies to residents of Canada, New Zealand and Australia, so we’re sorry to inform you that you can’t claim the Betsson Sports Welcome Bonus if you come from other territories. But we advise you to take a look at the Promotions section of the sports betting site to use other offers. Betsson Sports can also be played on mobile where a whole set of options are available. Where ever you are, just log into your account and bet while on-the-go. Use the Live Betting feature to take advantage of certain events and win repeatedly. Round 28 of the Premier League is just around the corner, and there are plenty of matches set for Tuesday and Wednesday. Aston Villa will face Everton at home, however the odds for the hosts are not good 5.00 (4/1), while The Toffees have the upper leg 1.75 (3/4). A draw for the game stands at 3.70 (27/10), but we believe that Everton will probably clinch the three points. On Wednesday, Arsenal will have a chance to redeem themselves against Swansea, after they suffered a 3:2 away loss to Manchester United at the weekend. As a result, they have slipped to third position on the table, but considering they’ll play at the Emirates their next encounter the will most likely seal a win 1.36 (9/25). A tie is unlikely 5.25 (17/4), while a win for the traveling side is virtually impossible 10.00 (9/1). Don’t miss the London derby between West Ham 4.00 (3/1) and Tottenham 2.00 (1/1) as well, while the real cracker will take place between Liverpool 2.50 (3/2) and Man City 2.90 (19/10). But before you place your wagers on these games, don’t forget to claim the Betsson Sports Welcome Bonus to get up to €50!